Employment continued on a slight upward trend for the third consecutive month, edging up 22,000 in November. The unemployment rate held steady at 6.9% for the third month in a row. So far this year, employment growth has averaged 13,400 per month, compared with an average of 25,400 over the same period in 2012. Provincially, employment rose in Alberta and declined in Newfoundland and Labrador, while it was little changed in the other provinces. In November, there were more people working in business, building and other support services; manufacturing; and information, culture and recreation. At the same time, employment decreased in public administration and construction. Overall, employment increases in the private sector were partially offset by declines in the public sector. More people aged 25 and over were employed in November, while youth employment declined. From November 2012 to November 2013, the unemployment rate declined 0.3 percentage points. Over the same period, the participation rate fell 0.4 percentage points to 66.4%, as the labour force grew at a slower pace than the population. After two months of little change, the number of people working in Alberta rose by 11,000 in November. However, the unemployment rate increased 0.3 percentage points to 4.7%, as more people were seeking work. Compared with 12 months earlier, employment in Alberta was up 78,000 or 3.6%, the fastest pace of year-over-year growth among the provinces. There were 2,600 fewer people working in Newfoundland and Labrador in November, leaving employment in the province at about the same level as 12 months earlier. The unemployment rate rose 1.3 percentage points in November to 12.3%. Following a notable increase in October, employment in Quebec was little changed in November. 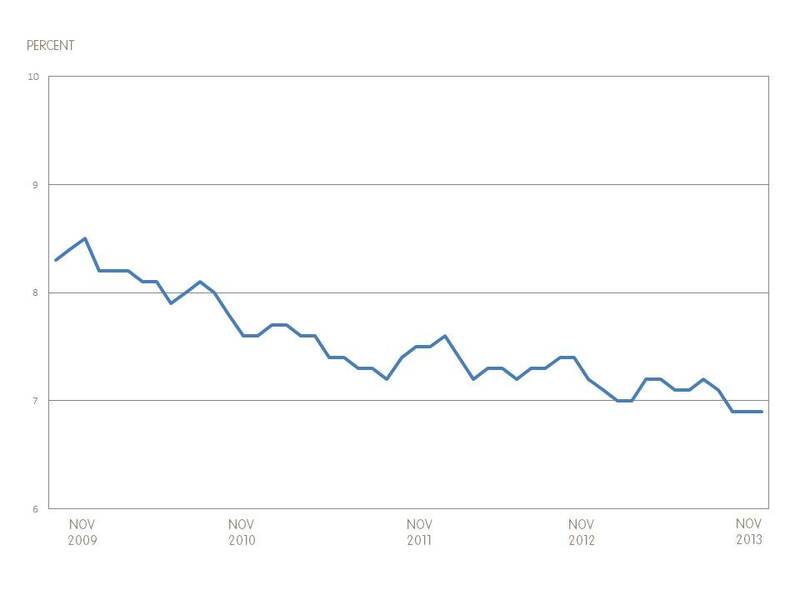 Nevertheless, the unemployment rate fell 0.3 percentage points to 7.2%, the result of fewer people searching for work. On a year-over-year basis, employment in the province was little changed. The number of people working in Ontario was also little changed in November, and the unemployment rate decreased 0.2 percentage points to 7.2%. 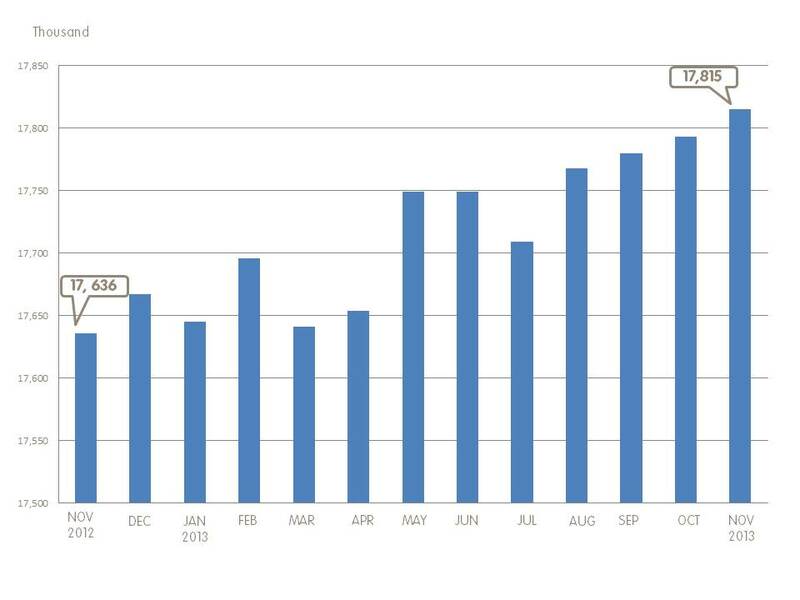 Compared with November 2012, employment in the province was up 86,000 or 1.3%. In November, 31,000 more people worked in business, building and other support services, offsetting a decline the previous month. On a year-over-year basis, employment in this industry was up 37,000 or 5.4%, with most of the growth in the first half of 2013. There were 25,000 more people employed in manufacturing in November. Despite this increase, employment in this sector was down 44,000 or 2.5% compared with a year earlier. Employment in information, culture and recreation also increased, up 16,000 in November. On a year-over-year basis, however, employment in this industry was little changed. The number of employees in public administration fell by 18,000 in November. Employment in this sector has been on a downward trend since February, declining by 69,000 or 7.0% over this nine-month period. Employment in construction also fell by 18,000. Despite this decline, the number of people working in construction was up 57,000 or 4.5% on a year-over-year basis. In November, a total of 51,000 more people were working in the private sector as employees or self-employed — an increase that was partially offset by a decline of 29,000 in the public sector. On a year-over-year basis, all of the gains were among private sector employees, up 187,000 or 1.6%, as there was little change in self-employment and the public sector. Employment increased by 26,000 for people aged 25 to 54, predominantly among men. Despite these gains, the employment level for this age group was similar to that of November 2012. Employment also increased for men and women aged 55 and over, up 22,000 in November, bringing total gains over the past 12 months to 157,000 (+4.8%) — partly the result of population aging. In contrast, employment for people aged 15 to 24 fell by 26,000, leaving youth employment at about the same level as 12 months earlier. As for their unemployment rate, it was unchanged at 13.4% in November, as fewer youth participated in the labour market.